Lenovo India has launched the Lenovo ThinkCentre M60e, one of the first desktops to sport the Rupee symbol on its Microsoft-compatible keyboard. Lenovo has partnered with Microsoft to prepare a user-friendly software solution and incorporate the Rupee symbol as per the Bureau of Industry Standards guidelines. The company has also announced that it will incorporate the Rupee symbol in all its products in the next few months. The company hopes inclusion of the Rupee symbol on keyboards will enhance the ease with which PC users utilise various Microsoft software applications such as spreadsheets, word documents etc. All this, of course, helps in further widening the usage of the symbol. 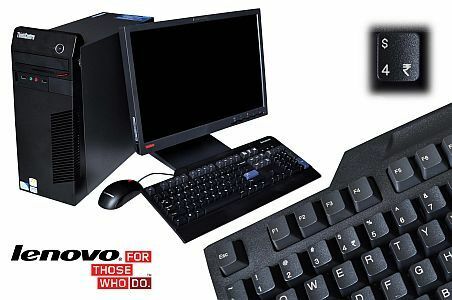 ThinkCentre M60e, the latest in string of ‘Think’ desktops by Lenovo, features Windows 7 Lenovo Enhanced Experience system, which promises a faster startup and shutdown. When Lenovo Zuk Z1 is getting software update in India (Android M & CM13)...? ?